Visual Studio Code>Azure>Azure Cosmos DBNew to Visual Studio Code? Get it now. Create, browse, and update globally distributed, multi-model databases in Azure. 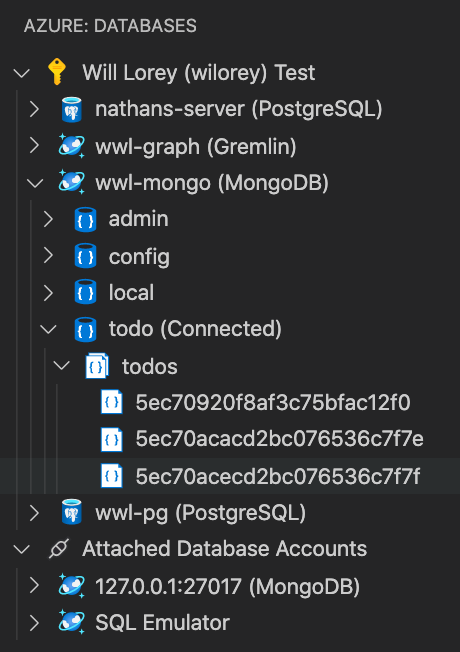 Browse and query your MongoDB databases both locally and in the cloud using scrapbooks with rich Intellisense then connect to Azure to manage your Cosmos DB databases with support for MongoDB, Graph (Gremlin), and SQL (previously known as DocumentDB). Some less-common commands in the Mongo scrapbook and use of the Mongo shell require installing Mongo DB and Mongo shell. Click on "Execute" above a command to execute it, or press CMD+" (Mac) or CTRL+" (Windows and Linux) to execute the line with the cursor. You can now import documents from your workspace into CosmosDB. Use the context menu of a collection or a document file (json) to get started! Configure the user setting cosmosDB.graph.viewSettings to customize which properties to display and which colors to use based on vertex label. Azure no longer supports gremlin queries on pre-GA graph accounts. If you see the error "Could not find a valid gremlin endpoint for graph", then choose "Open Portal" on the graph node and check the "Gremlin Endpoint" in the Overview tab. If it does not take the form of '...[graph-name].gremlin.cosmosdb.azure.com...', then you will need to create a new graph account using the Azure portal or the current version of the extension. Support for escapes in the scrapbooks is preliminary. We currently do not support escaped characters as is inside a string - the characters need to be double escaped. For example, newlines in the string should be '\\n' instead of '\n' to be recognized correctly. If you find any issues with how the scrapbook handles escapes, please add to issue #937.